THERE was nothing very remarkable in that, nor did Alice think it so very much out of the way to hear the rabbit say to itself "dear, dear! I shall be too late!" (when she thought it over afterwards, it occurred to her that she ought to have wondered at this, but at the time it all seemed quite natural); but when the rabbit actually took a watch out of its waistcoat-pocket, looked at it, and then hurried on, Alice started to her feet, for it flashed across her mind that she had never before seen a rabbit with either a waistcoat-pocket or a watch to take out of it, and, full of curiosity, she hurried across the field after it, and was just in time to see it pop down a large rabbit-hole under the hedge. In a moment down went Alice after it, never once considering how in the world she was to get out again. 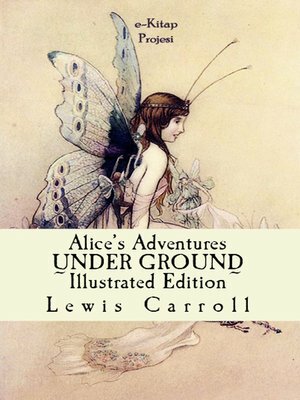 The rabbit-hole went straight on like a tunnel for some way, and then dipped suddenly down, so suddenly, that Alice had not a moment to think about stopping herself, before she found herself falling down what seemed a deep well. Either the well was very deep, or she fell very slowly, for she had plenty of time as she went down to look about her, and to wonder what would happen next. First, she tried to look down and make out what she was coming to, but it was too dark to see anything: then, she looked at the sides of the well, and noticed that they were filled with cupboards and book-shelves: here and there were maps and pictures hung on pegs. She took a jar down off one of the shelves as she passed: it was labelled "Orange Marmalade," but to her great disappointment it was empty: she did not like to drop the jar, for fear of killing somebody underneath, so managed to put it into one of the cupboards as she fell past it.